If you have a website with a lot of content, over time visitors might read your new posts but ignore or just be oblivious of your older content. A good way to solve this problem is to cross promote your posts. Are you looking to make your readers stay longer on your site? Are you the one who cares about bounce rate? If the answer for the above all questions are yes you have come at a right time. So, here in this article I have listed some of the best WordPress related posts plugins for implementing the related content feature. Some plugins will find and list related posts automatically, while others will require some manual intervention by the user. If you enjoyed the following article we humbly ask you to help us spread the word by sharing this article with your peers! Author Recommended Posts lets you easily search and choose specific posts, pages and custom post types you want to associate to a post or page. You can add, reorder, remove selected posts for display via the simple drag and drop interface. Display your recommended posts vertically or side-by-side. Filter which content is searchable and which post types to automatically output on. Increase your visitors engagement by providing them with related articles from your website. VRP uses tags to find related posts and then displays them according to your conditions. Being responsive, it will automatically adjust to your layout. So you can insert VRP anywhere in your template. A beautiful, modern, animated, responsive Related Posts Plugin. Related posts displayed at the bottom of the post. Generate beautiful responsive carousel slider. Touch and drag the slider. Provide a lot of options to set, flexible configuration appearance. Display related posts via categories, tags or customize. A collection of helpful shortcodes that I use in my own work that I wanted to share with the WordPress Community. If you want to suggest any shortcodes. Displays inline code snippets that are visually different than the body text. Displays a simple code block for simple, small pieces of code. Displays a message with appropriate color that you can use to notify users of how their interaction is working. Kindred Posts uses artificial intelligence to learn how your website visitors use your site and recommends content based on their interests. This easy-to-use plugin requires almost no setup. You simply activate the plugin and drag a widget into your theme to start recommending content. Related Posts by Zemanta brings new visitors to your site, helping you increase your reach and readership. Related Posts is unique because it gives you the option to editorially curate related content for each post, or let Zemanta automatically recommend sources from around the web. Carousel horizontal posts content slider is a jQuery powered and carouFredsel library based slider. It allows you to showcase your posts in a nice sliding manner. It has plenty of user-friendly options to configure the slider easily. Custom option to override styles, if necessary without editing the css files. Option to enable CSS3 / hardware acceleration for transitions. CP Related Posts is a plugin that displays related articles on your website, manually, or by the terms in the content, title or abstract, including the tags assigned to the articles. CP Related Posts offers a great versatility in displaying related posts. With CP Related Posts, you can define the number of related posts, use a specific layout to display related articles. Related Posts Plugin allows to display a list of post titles by the widget or by the shortcode. It displays related posts with similar words in category, tags, title or by adding special meta key for posts. Related Posts Plugin is simple to use and to customize – this is what you are looking for. 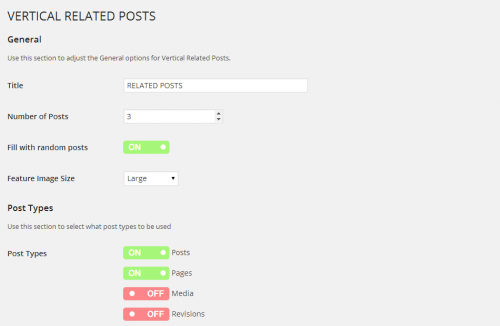 A simple ‘related posts’ plugin that lets you select related posts manually. Supports any post types in WordPress, including custom ones. The plugin was written to have the option to add related posts to each blog post using a simple but functional plugin. You can select the related posts yourself manually. Display related posts without slowing down your website! Link all your existing content with only 1 click, get related posts for all your posts today! Related Posts for WordPress is fully compatible with WPML. Related Posts for WordPress will find and link related posts per language you’ve setup in WPML. Our plugin displaying related posts in a very great way to help visitors staying longer on your blog. You can use this plugin to increasing the page rank of your internal posts to improve your SEO score. Automatic: it will start displaying related posts on your site automatically after the content when you activate the plugin. No need to edit template files. Help your readers find other related content from your old content.